We put recycling bins in all of the classrooms, we recycle bottles, paper and more. We put information on our network and try to not print out paper when we don't have to. Cambridge Junior College is an accredited junior college in Yuba City and Woodland, CA that offers hands-on programs for students looking to change or advance their career path and focus. We offer business and healthcare career training and are focused and passionate about the services we provide to our students. As one of the accredited vocational schools in Yuba City and Woodland, we know our graduates will become the foundation to our local economy, and we are improving our community one graduate at a time. Cambridge Junior College is accredited by the Accrediting Council for Independent Colleges and Schools to award certificates, diplomas and Associate degrees. The Accrediting Council for Independent Colleges and Schools is listed as a nationally recognized accrediting agency by the United States Department of Education. Students may request copies of the above documents to review by submitting the request in writing to the director. Applying to college is a big decision and one that can drastically change your future. 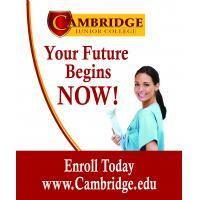 Cambridge is honored that you are considering choosing us as your career college in California. Our admissions staff is eager to meet with you to understand your goals and match you with the business or healthcare training program that's right for you. Whether you're interested in pursuing healthcare career training or earning your associate degree in business administration, the application process is easy and convenient. Our Admissions staff will give you a tour of the campus, introduce you to instructors and guide you through the admissions process. In addition, our admissions staff will connect you to a Financial Aid Representative who will assist you with any financial aid that may be available to you. 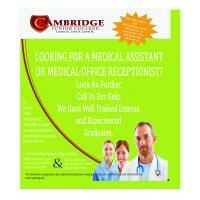 Cambridge is able to offer Cal Grants for those who qualify. See one of our Financial Aid Officers to see what you qualify for. We now offer GI Bill for those who qualify. Come by and see one of our Financial Aid Officer's to see what you qualify for.